It’s been so hot here and I haven’t been up to making big meals for dinner. 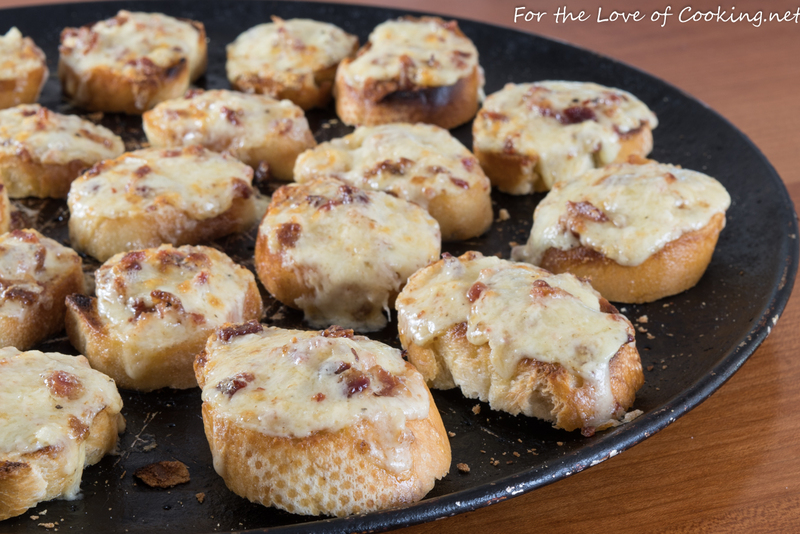 I wanted to make something easy and fairly light and these white cheddar and bacon crostini were the perfect choice. 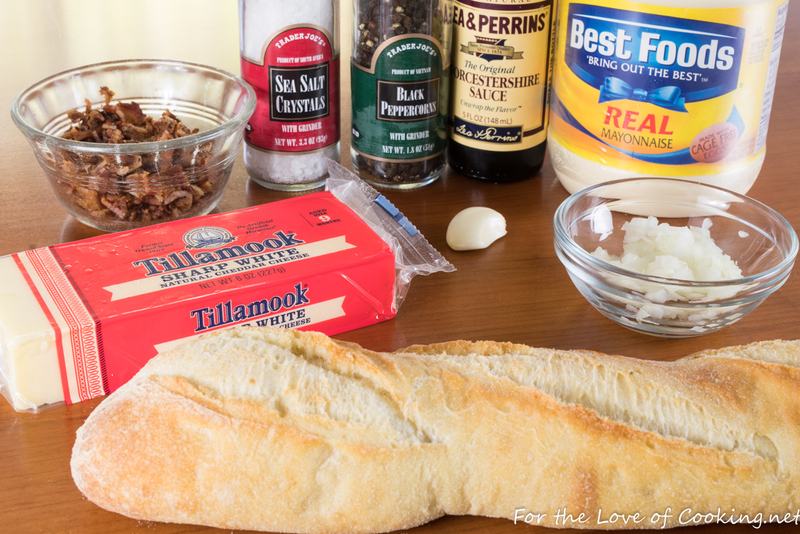 I loved the creamy combination of the cheese, bacon, mayo, onion, garlic, and Worcestershire sauce melted on the crisp baguette slices. – yum! 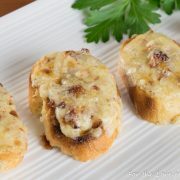 I served these cheesy crostini along with a big salad and some fresh watermelon for a delicious summer weeknight meal. This recipe was so quick and easy to make and we all thought it was a fun and tasty dinner! 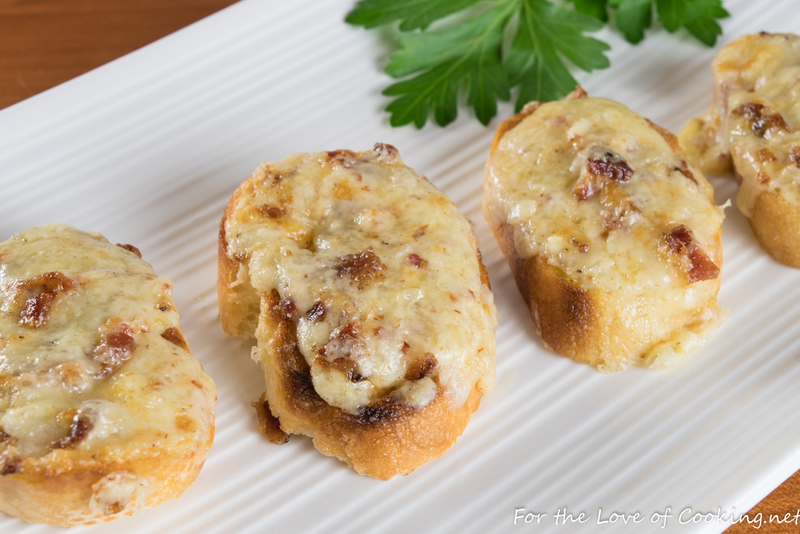 Combine the shredded white cheddar cheese with the bacon bits, mayonnaise, minced onion, minced garlic, Worcestershire sauce, and freshly cracked black pepper, to taste. Stir until very well combined. Slice the baguette and place it on a baking sheet. Turn on the broiler to high and place the rack near upper middle position. Broil the baguette slices for a few minutes, making sure to watch carefully, until just golden brown. Remove from the oven. Spoon the cheese mixture evenly on top of each baguette slice. Place back under the broiler and broil, making sure to watch carefully, until they are golden brown and bubbly. Remove from the oven and serve immediately. Enjoy. 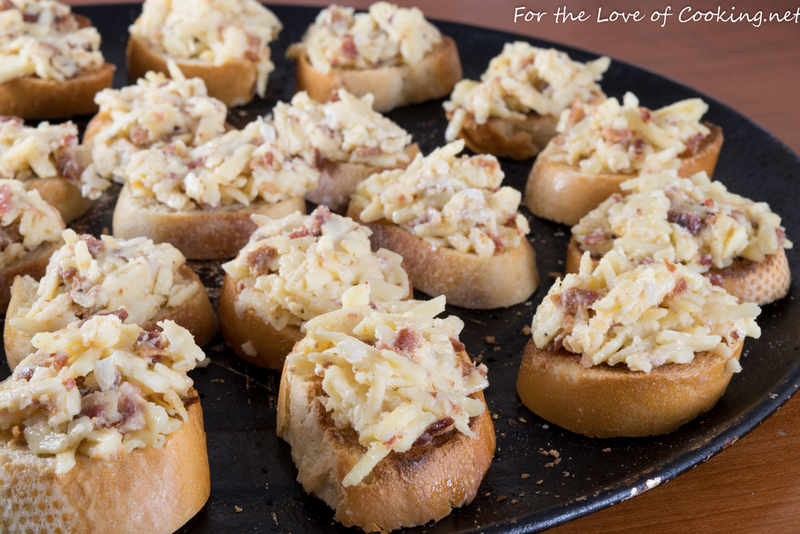 Combine the shredded white cheddar cheese with the bacon bits, mayonnaise, minced onion, minced garlic, Worcestershire sauce, and freshly cracked black pepper, to taste. Stir until very well combined. Slice the baguette and place it on a baking sheet. Turn on the broiler to high and place the rack near upper middle position. Broil the baguette slices for a few minutes, making sure to watch carefully, until just golden brown. Place back under the broiler and broil, making sure to watch carefully, until they are golden brown and bubbly. Remove from the oven and serve immediately. Enjoy. They look absolutely irresistible! Well, who could ever resist cheddar and bacon? I certainly can’t! With good cheese and bacon, it has to be good. It’s been too hot to cook here, too. This is such a perfect solution — great flavor, easy and fast prep. Winner! Good recipe — thanks. Yum. Bacon and cheese – doesn’t get any better than that. It looks terrific! I wonder if my boys would let me get away with something light like this?